MasterBoy is a Game Boy, Sega Master and Game Gear Emulator for the PSP. It allows you to fully recolor your Game Boy games, not only by selecting one palette for the whole screen, but by recoloring each object on the screen! And you don't need to be a programmer, there's no romhacking (you keep using the original ROM) and it works for nearly all existing games. It features a skinnable interface with nice effects and quite a lot of options. 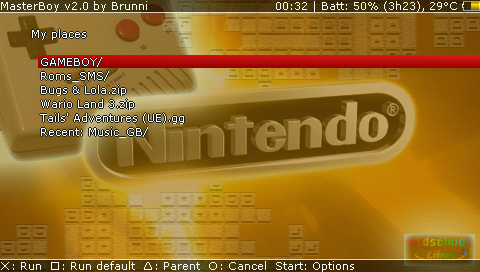 You can also listen to your favorite VGM and GYM files with the included music player. Important! Everything about ColorIt has now been moved to the Heig-Boy page! - Corrected the garbage showing in the border of the render. - Reworked the default palettes to be closer to the GBC ones. - Augmented the maximum number of files per folder to 1024. Note: The bug that some people has, save states not working after saving/loading a few, is still not fixed (I could contact nobody who has this problem for debugging). In between, if you have this problem, use the RAM state and save manually before exiting (or save less often ). 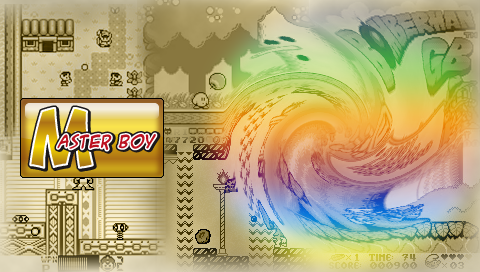 Sorry, I forgot it... but here is the source code for the latest version of MasterBoy. This is the source code of MasterBoy.